Nov. 7, 2018, 2:27 p.m.
By Joshua Benton @jbenton Nov. 7, 2018, 2:27 p.m.
Big night! 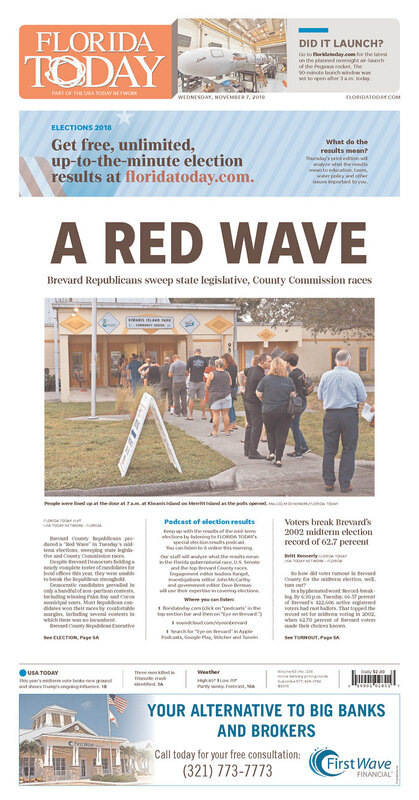 The U.S. midterm elections yesterday mostly went according to expectations: Democrats retook the House of Representatives, Republicans kept (and grew) their control of the Senate, and a variety of governor’s races went a variety of ways. 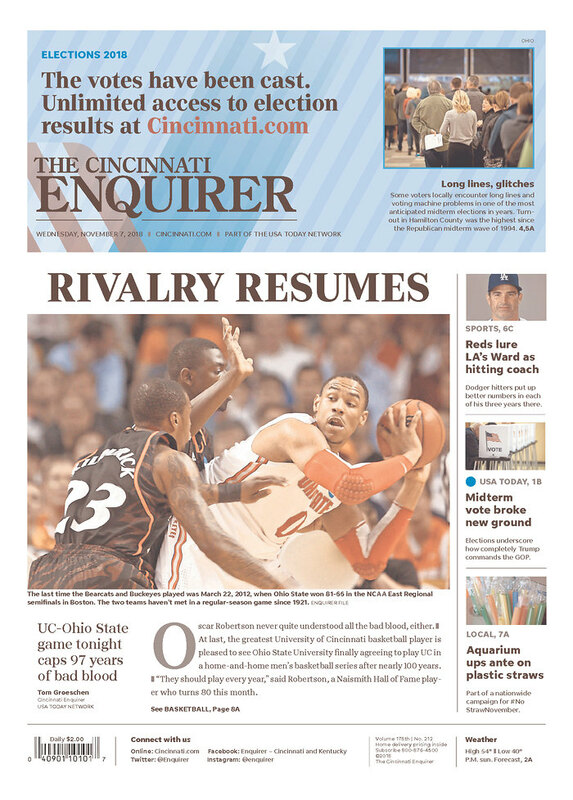 It’s a move both to push readers online and to reduce costs. The cost savings come in and around print production. 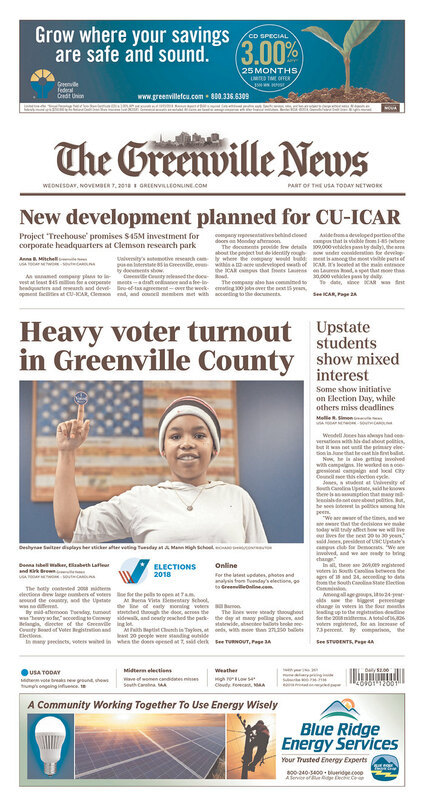 It looks pretty spare — but it appears some Gannett papers did get dispensation to give their high-price-paying print readers a little late-breaking detail. 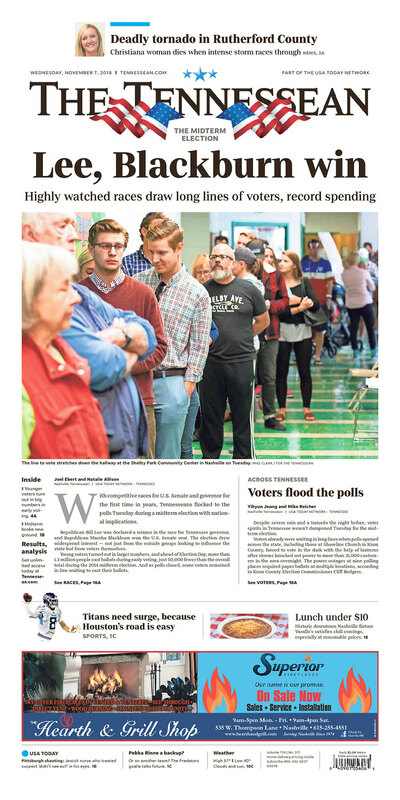 In Indianapolis, the Star let readers know the “Opportunity to vote proves worth the wait.” Hopefully, the results proved worth waiting for too. Senate candidates Mike Braun and Joe Donnelly were “glad to see voters coming out in droves” — though in the end, only Braun was happy about it. 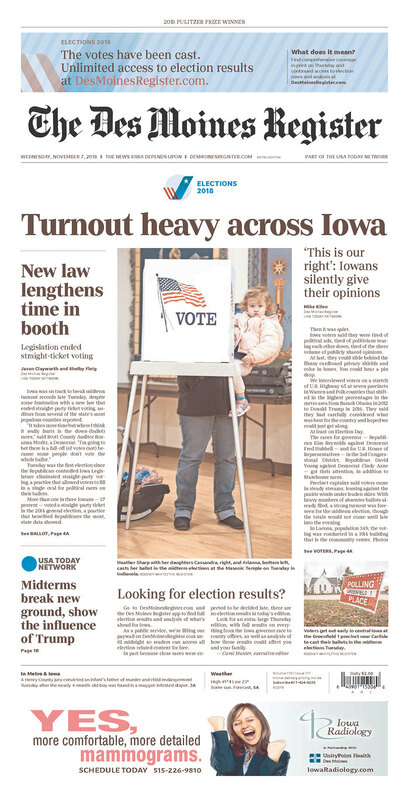 Some Gannett papers were able to get at least a mention of a result on the front page, though — usually in bigger markets. 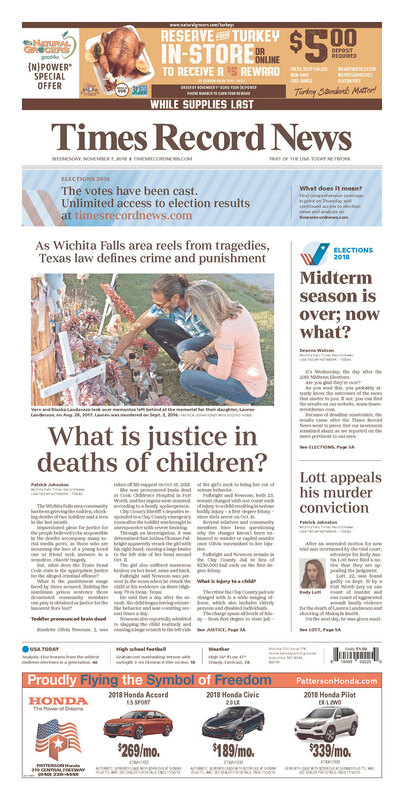 In Texas, El Paso’s native son Beto O’Rourke “draws spotlight,” but then again, he’s done that for quite a few months now. 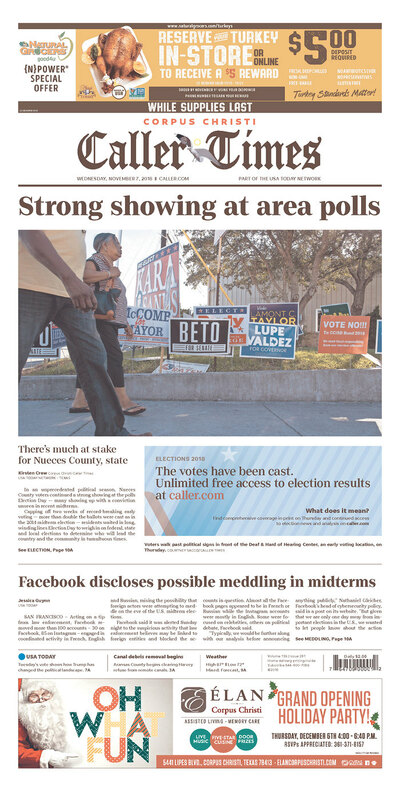 But note that the El Paso Times did manage to sneak in O’Rourke’s defeat — in the subhead and in the awkwardly squeezed-in second graf. There’s also a classic candidate party photo at bottom right; Veronica Escobar won a reliably Democratic district by 31 percentage points, so no one needed to wait for a tally. 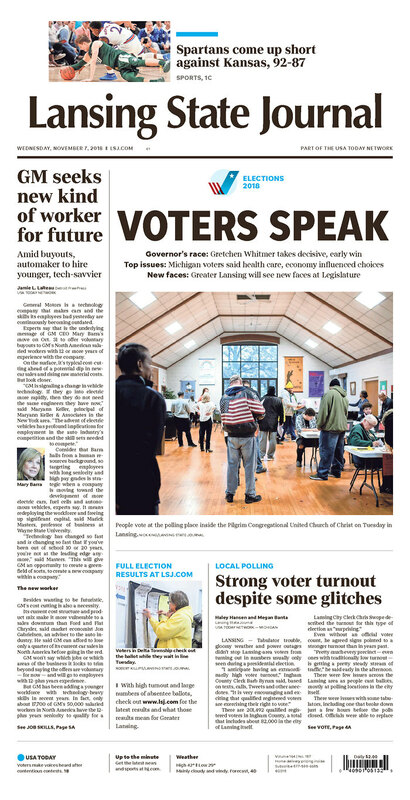 Meanwhile, Gannett Texas readers in Abilene, Corpus Christi, and Wichita Falls got no results. 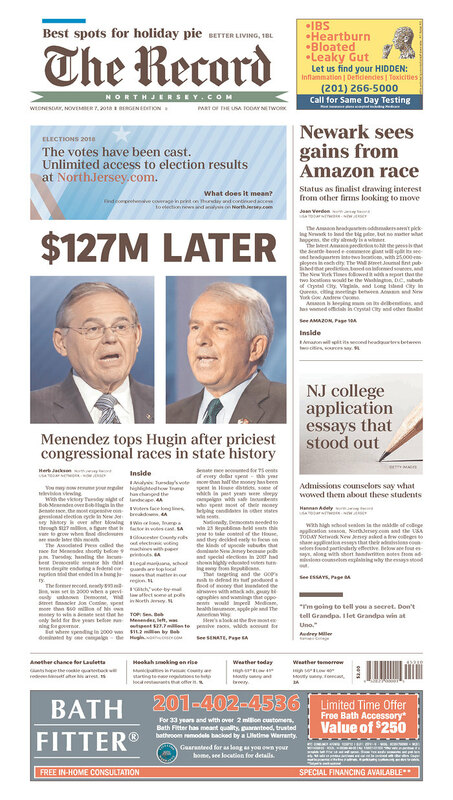 New Jersey’s Bergen County Record did something similar to El Paso: The election result in its Senate race gets crammed into the subhead and second graf of a separate story about campaign spending. 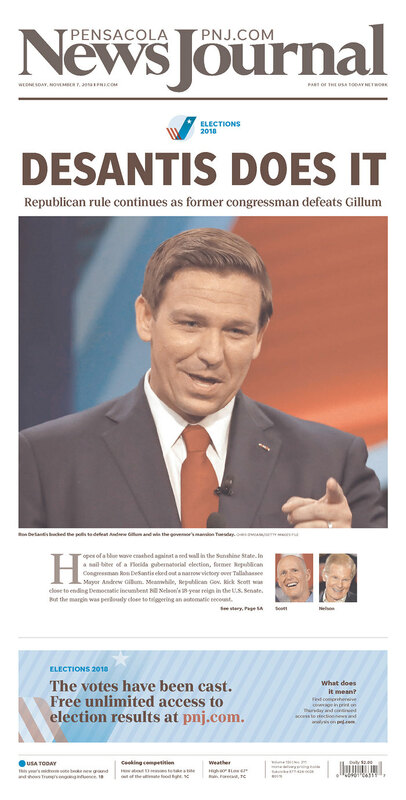 One place that stood out was Florida, where Gannett papers were able to get local or state results on the front page — even, in some markets, the late-breaking result of the Ron DeSantis–Andrew Gillum governor’s race. 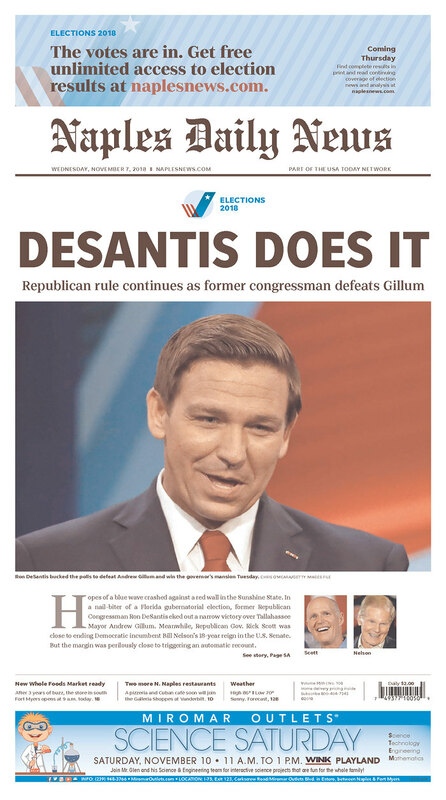 The Arizona Republic, thanks no doubt in part to its time zone, was able to get the national House flip in, as well as the governor’s easy reelection (thought only in a subhead). 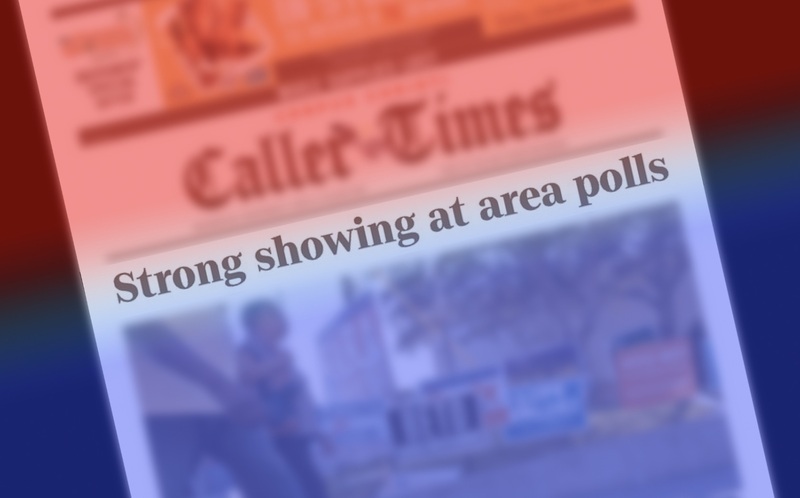 The tight Senate race doesn’t get called, but that’s again very understandable since the AP still hasn’t called it as of this afternoon and it could take days to finalize. 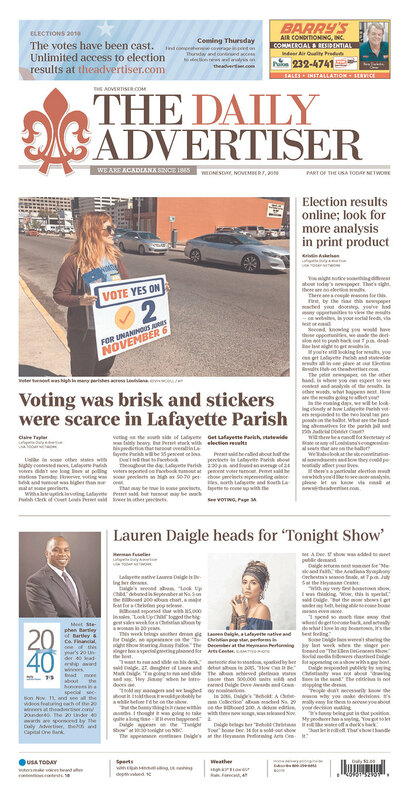 The Clarion-Ledger in Jackson, Mississippi, was able to report that there were no surprises — a predicted runoff in one Senate race and expected reelections in other contests. 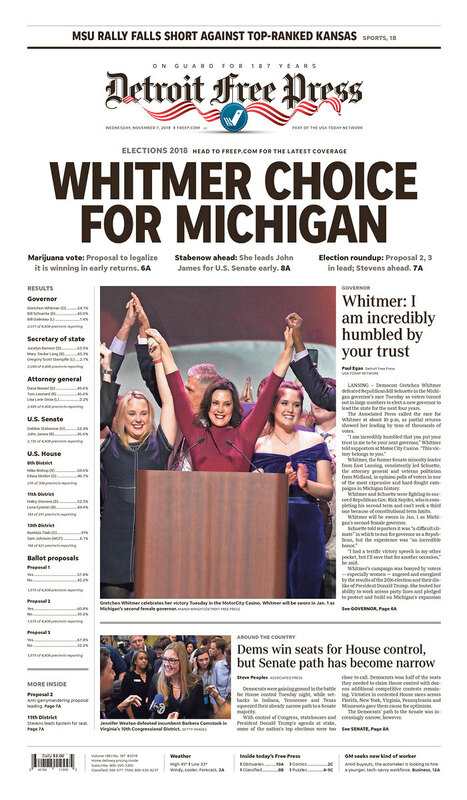 And in Detroit (pop. 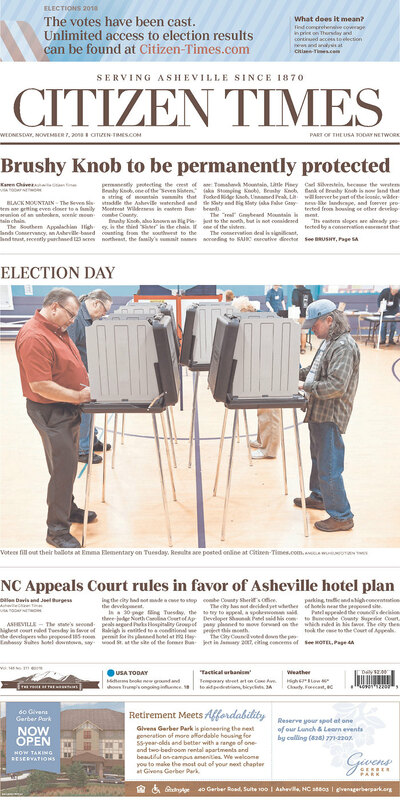 673,104), readers of the Free Press got something closer to traditional next-day coverage: a relevant headline, a victory photo, quotes from the winner, and — the only time I saw this in my scanning of Gannett front pages — some actual (if partial) vote totals. So was all this a reasonable compromise for a time-limited medium? 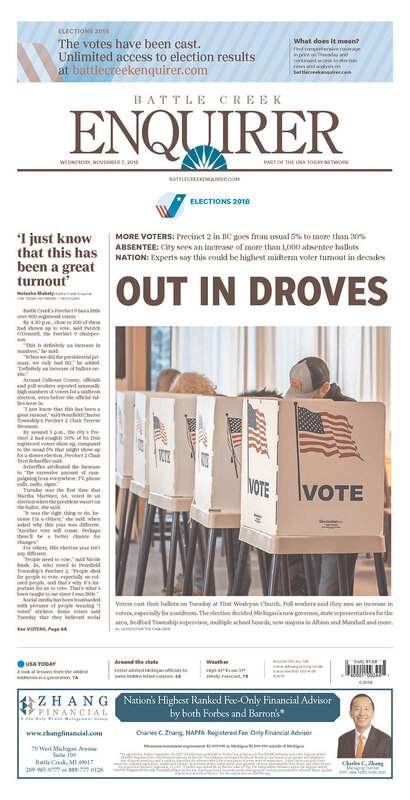 Were print newspaper subscribers — who tend to be older and have often been loyal readers for decades — satisfied with hitting the iPad in the morning for results? Or was this the sort of thing that can make a subscriber turn into an angry caller to Circulation to an ex-subscriber? Gannett will know the answer to that soon enough. 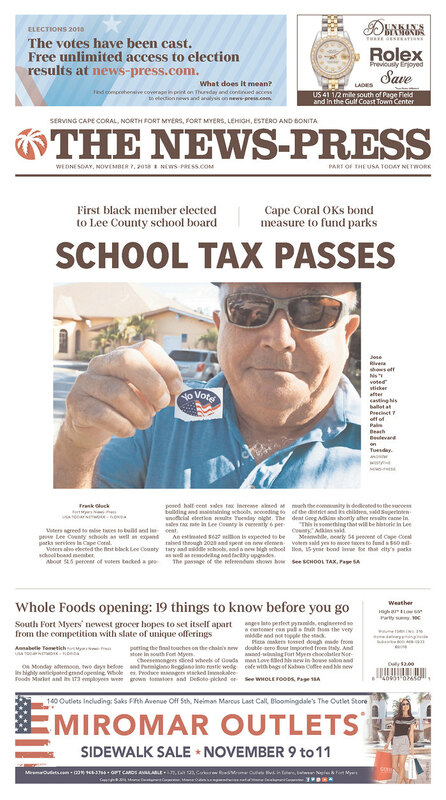 My Gannett-owned paper gets thinner and thinner, yet the cost increases twice each year for half the content. 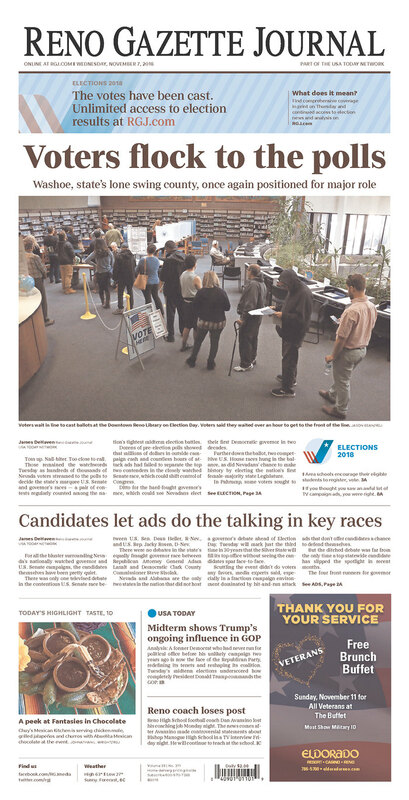 All that said: If you don’t publish any election results, you also can’t screw up any election results. POSTED Nov. 7, 2018, 2:27 p.m.
Benton, Joshua. 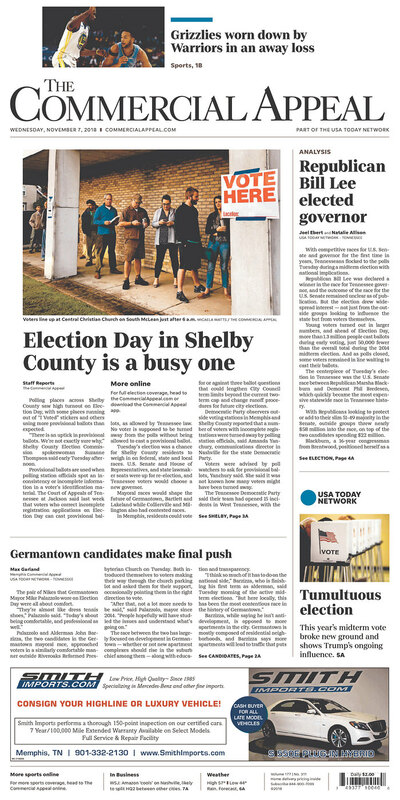 "In cities across America, this morning’s newspaper told you there was an election yesterday — but nothing about it." Nieman Journalism Lab. Nieman Foundation for Journalism at Harvard, 7 Nov. 2018. Web. 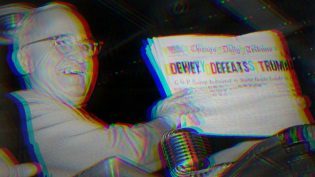 25 Apr. 2019. Benton, Joshua. 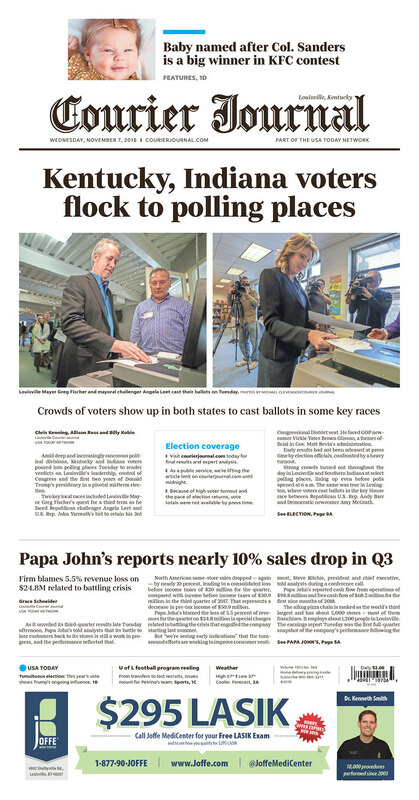 "In cities across America, this morning’s newspaper told you there was an election yesterday — but nothing about it." Nieman Journalism Lab. Last modified November 7, 2018. 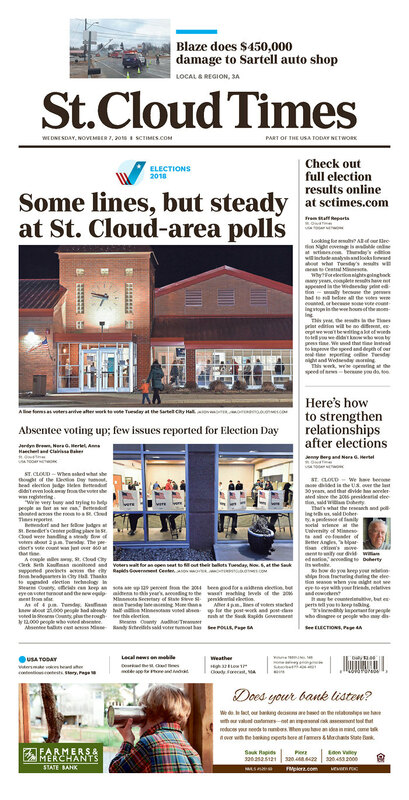 Accessed April 25, 2019. https://www.niemanlab.org/2018/11/in-cities-across-america-this-mornings-newspaper-told-you-there-was-an-election-yesterday-but-nothing-about-it/.